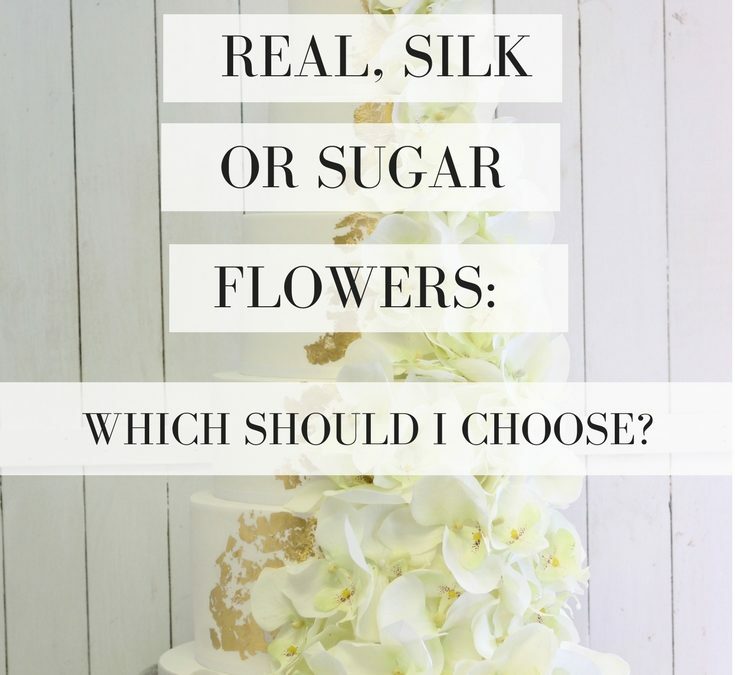 During our wedding cake consultations, we always stumble upon the subject of real flowers VS sugar flowers (real flowers being flowers purchased at a florist vs flowers made of sugar, handcrafted by us). Given how often we are asked, we thought we would write a blog post outlining the pros and cons of each, to help make the decision easier! We work closely with our local florists to find you the perfect flowers that are in season and will look the best with your cake design. Our florists will make sure the flower is pesticide, free, and organic, especially if the flowers will be in contact with the cake. In other situations, we can offer an oasis tray (a little tray with beads to keep florals hydrated) which we can sit on top of a cake to avoid cross-contamination. 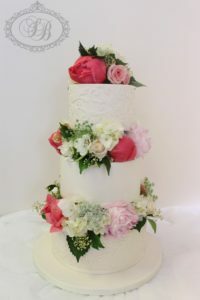 It is important to note that some flowers are poisonous – which means no matter how much you want to use them on your cake, you will have to use sugar ones. A surprising number of popular flowers are poisonous, including Lily of The Valley, Rhododendron, Wisteria, Hydrangeas and Chrysanthemum. 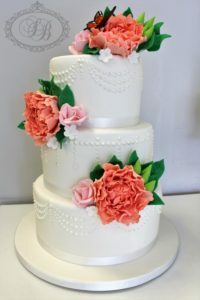 Considering the design of the cake is also important when you are deciding to use fresh or sugar flowers. Although real flowers come in many shapes, sizes and colours, a flower is a flower. 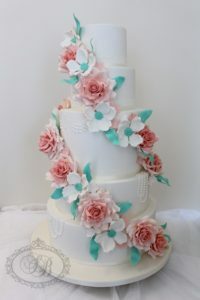 You cannot change add new petals, or tint the colour to match the theme of your wedding cake. 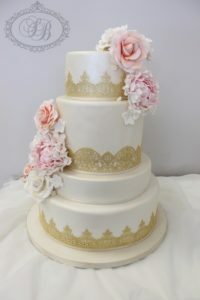 It is quite difficult to match custom wedding cake colours with fresh flowers, while with sugar flowers, you can custom create any design imaginable. Another con of choosing fresh florals is the fact they are going to wilt. We can take precautionary steps to counter-act this – for example delivering the cake just before it will be cut, and using hydration beads, but eventually fresh flowers will inevitably, wilt, and die. Sugar flowers, on the other hand, will stay intact for a very long time – some couples like to keep their sugar flowers for decades! 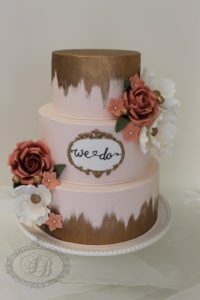 Sugar flowers are a great option if you are wanting a custom, unique floral design on your cake. As we are handcraft each and every flower, we can design the arrangement to look anyway you want –as well as customising the colour! 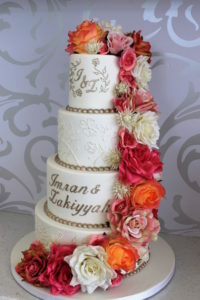 Some couples like their flowers to look a little animated, where as some couples want the sugar flowers to look as realistic as possible. Sugar flowers are a particularly good option if your favourite flower is out of season – we can make our sugar flowers to look just like real flowers! 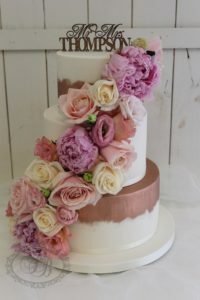 If you opt for a sugar flower design, there is no need to worry about pesticides or chemicals near the cake – sugar flowers are literally just made of sugar and colouring! Because of this, they are able to keep for a very long time if they are looked after well. We recommend storing them in a cardboard box, which allows them to breathe. We have had a couple come in and use one of their parent’s flowers from their wedding cake back in the day – how adorable is that! The only con of sugar flowers may be the cost. Creating sugar flowers requires a lot of time and patience, as we individually create every single petal, and this is reflected in the price. 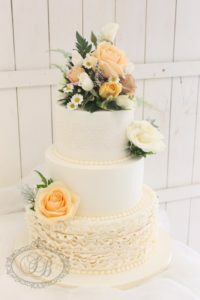 Of course, the price is dependent on what and how many flowers you may be needing, all of which will be discussed during our complimentary wedding cake consultation! If you aren’t completely sold on real flowers or sugar flowers… we have another option up our sleeves: SILK FLOWERS! Silk flowers got their name over a hundred years ago when these fake florals were made with silk, however these days silk flowers just means any kind of artificial flower, silk or synthetic! Silk flowers are a great option for a lot of people – some feel strange about putting real flowers on their wedding cake, and will often opt for silk flowers. Seasonality plays a huge part too – you can’t get real tulips for a summer wedding, but you can get silk ones! Silk flowers are significantly less expensive than real or sugar flowers, and they also require low maintenance. So what’s the downside you ask? Some people perceive silk flowers to look obviously fake – and while this may have been the case in the 80s, these days you can’t even tell the difference! 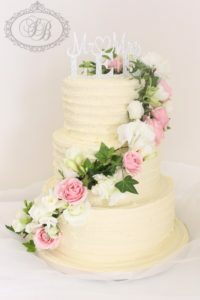 We hope this blog post has helped you make a decision on whether you would prefer real, sugar or silk flowers on your wedding cake! If you have any further questions, you can call us on 09-836-8806, or you can book your complimentary wedding cake consultation right here.